Australian Luke Brabin Wins AU$1,100 No-Limit Hold'em Accumulator (AU$131,365)! Luke Brabin came into the final day of play with the chip lead, and he successfully rode that big stack all the way to the winner's circle, capturing his first gold bracelet and the AU$131,365 top prize. At the start of the day, just nine players stood between Brabin and the title. After Kahle Burns fell in 10th place, David Profaca was the next to go in ninth. Then, Brabin busted Piyush Gupta in eighth place before Didier Guerin took out Brian McAllister in seventh. Those first four eliminations only took 20 hands of play, but things slowed after that. Zane Ly didn't bust in sixth place until the 49th hand of the day, and then Ryan Hong exited 10 hands later. Four-handed play lasted for a little while, but then Stephen Lindeblad bounced to the payout desk in fourth place, as Brabin scored his second elimination of the day. In third fell Daniel Murphy, and he too was busted by Brabin, but only after Brabin scooped the largest pot of the tournament from Murphy. That big pot took place on the 111th hand of the day, with Brabin and Murphy getting the money in on the board. Both had trip tens, but it was Brabin's that out-kicked the for Murphy. Murphy did have a flush draw, but the on the river gave him no help and the nearly 1.5 million-chip pot was sent Brabin's way. A couple hands later, Brabin finished off Murphy to set up a one-sided heads-up affair with Guerin. 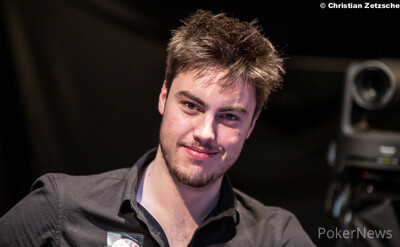 Guerin began heads-up play with 216,000 to Brabin's massive 1.617 million. Guerin tried to fight and actually took most of the first few pots, but Brabin was just too much in the end. On the final hand, Guerin shoved the and lost out to Brabin's . With that, the first event of the 2014 World Series of Poker Asia-Pacific is in the books, and Australian Luke Brabin will forever have his place in poker history. The first event of the series may be a wrap, but that doesn't mean the PokerNews coverage stops here. There's still nine more gold bracelets to be awarded, and you can follow along with all the events here. Hand #115: Didier Guerin began heads-up play with the button, and he raised all in straight away. Luke Brabin folded, and Guerin won the pot. Hand #116: Brabin had the button on the second hand of heads-up play, and he limped in. Guerin shoved from the big blind, and Brabin folded. Hand #117: On the button, Guerin limped in. Brabin checked his option, and the flop came down . Brabin checked, Guerin bet 30,000, and Brabin folded. Hand #118: Brabin began the hand on the button, and he limped in. Guerin checked his option from the big blind, and the flop came down . Guerin checked, Brabin fired a bet, and Guerin quickly folded. Hand #119: Guerin had the button, and he raised all in. Brabin folded, and Guerin won the pot. Hand #120: Brabin and Guerin saw the for the minimum, and both players checked to see the land on the turn. Guerin was first and bet 35,000. Brabin folded, and Guerin won the pot. Hand #121: On the button, Guerin raised all in. Brabin asked for a count and was informed Guerin's shove was worth 306,000. Brabin called. Guerin was all in with the , and Brabin tabled the . 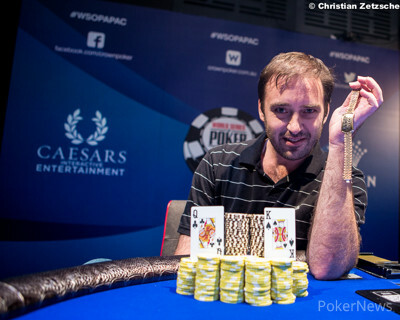 Brabin was ahead, but he would need to fade Guerin's outs in order to claim the first gold bracelet of the 2014 World Series of Poker Asia-Pacific. The flop came down and added a nice little sweat with Guerin picking up an open-ended straight draw along with his live cards. The turn was the to pair the board, and that changed nothing, leaving Guerin needing to hit the river to stay alive. The dealer burned before the river and then delivered the . That did it and eliminated Guerin in second place. For his effort, Guerin earned AU$81,220, but it would be Brabin walking away with the title, the bracelet, and the AU$131,365 top prize. Hand #112: Luke Brabin received a walk in the big blind. Hand #113: Brabin raised to 40,000 from the small blind and Didier Guerin called out of the big blind. Both checked the flop and Brabin won the pot on the turn with a bet of 54,000. The flop was save for Murphy, but the turn provided additional outs for Brabin. You could hear shouts from the rail and the river sent Murphy out in 3rd place for a payday of AU$59,334. Hand #109: Didier Guerin had the button and folded. Daniel Murphy raised to 38,000 from the small blind and won the pot. Hand #110: Murphy had the button and folded. Luke Brabin limped in from the small blind, and Guerin checked his option from the big blind to see the flop. Brabin checked, and Guerin bet 25,000. Brabin called. The turn was the , and Brabin checked. Guerin also checked, and the completed the board on the river. Brabin bet 35,000, and Guerin cocked his head to the left while he studied the board. Guerin folded in the end, and Brabin won the pot. Hand #111: Brabin started the hand with the button, and he raised to 32,000. Murphy called from the big blind, and the flop came down . After Murphy checked, Brabin fired 44,000. Murphy check-raised to 109,000, and Brabin called. Fourth street was the to pair the board. Murphy fired 127,000, and Brabin raised all in for 586,000 total. Murphy tanked for a little bit, and then called with the for trips plus a flush draw. Brabin had the for trips with a better kicker. The river completed the board with the , and that gave Brabin the massive pot to push his stack to 1.471 million. Murphy was left with around 100,000. Hand #103: Daniel Murphy limped from the small blind and Luke Brabin checked his option in the big blind. The two of them checked the flop and Brabin took it down with a bet of 40,000 on the turn. Hand #104: Brabin raised to 39,000 from the small blind and Didier Guerin mucked his cards. Hand #105: Guerin moved all in from the small blind and picked up the antes and the big blind of Murphy. Hand #106: Guerin raised to 33,000 from the button and Brabin called out of the big blind. Both checked the flop. The showed up on the turn and Brabin led out for 52,000 chips. Action over to Guerin, who gave it some thought before sending his cards into the muck. Hand #107: Brabin completed from the small blind and Guerin grabbed some chips, eying his stack carefully. He then bet 50,000 and Brabin quickly surrendered. Hand #98: Daniel Murphy began the hand with the button, and he folded to put the action on Luke Brabin in the small blind. Brabin raised to 36,000 and won the pot. Hand #99: Murphy got a walk in the big blind. Hand #100: Didier Guerin had the button, and he folded. Murphy was in the small blind and called before Brabin checked his option from the big blind. The dealer spread the flop, and both players checked to see the land on the turn. Murphy bet 27,000, and Brabin folded. Hand #101: On the button, Murphy raised to 39,000. Guerin called from the big blind, and the flop came out . Guerin checked, Murphy bet 43,000, and Guerin called. The fell on the turn, and Guerin checked. Murphy checked behind, and the river was the . Guerin reached for chips and bet 67,000. Murphy eyed Guerin's stack and then his own. Eventually, the only man sporting sunglasses made the fold, and Guerin won the pot. Hand #102: The button was with Brabin to start this hand, and he folded. Guerin was in the small blind, and he raised to 40,000. Murphy called from the big blind, and the two took the flop. Guerin was first and bet 50,000. Murphy snapped. The fell on the turn, and Guerin checked. Murphy checked right behind, and the river was the . Guerin checked, and Murphy immediately tossed out two chocolate T25,000 chips for a bet of 50,000. Guerin folded. Hand #93: Luke Brabin peeked at his cards and made it 32,000 to go. He claimed the blinds and antes. Hand #94: Daniel Murphy raised to 34,000 from the small blind and Brabin called to see the heads-up flop of . The continuation bet of 38,000 by Murphy was called and he didn't slow down the aggression on the turn either. This time though, the 42,000 bet was enough to enforce a fold by Brabin. Hand #95: Brabin limped from the small blind and Didier Guerin checked. The flop got checked to him and Guerin won the pot with a bet of 25,000. Hand #96: Brabin raised from the button to 32,000 and Guerin announced all in. Murphy started singing to get into the groove but mucked his cards. Brabin folded as well and Guerin picked up the pot. Hand #97: Murphy raised to 33,000 and Brabin called to see the flop of . Murphy announced a bet of 68,000 and Brabin mucked. Hand #87: Luke Brabin raised to 38,000 from the button and took down the pot. 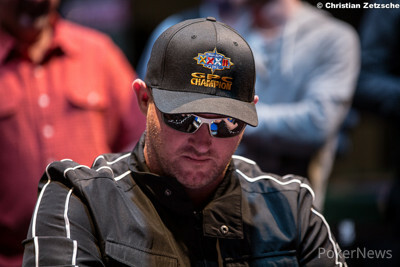 Hand #88: Daniel Murphy and Brabin went heads up to the flop, and Murphy bet 77,000. Brabin folded , and Murphy won the pot. Hand #89: Murphy began the hand with the button and raised to 34,000. Everyone folded. Hand #90: Brabin had the button and raised to 32,000. Murphy called from the big blind, and the flop came down . Murphy checked, and Brabin bet 45,000. Murphy folded, and Brabin won the pot. Hand #91: Didier Guerin had the button, and he folded to put the action on Murphy in the small blind. Murphy raised to 52,000, and Brabin gave it up. hand #92: Murphy started the hand on the button, and he folded. Brabin also folded, and Guerin won the pot.